Whether you like to shop, visit museums, or just have cheap family fun, Hampton, Virginia, has several free family vacation spots. They range from world-class to low-key, and if you're on a budget, they're just your speed. 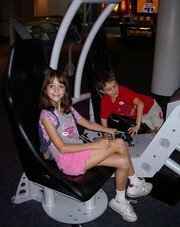 Come fly at the Air & Space Museum! You can choose from high-tech science centers like Virginia Air & Space Museum and low-budget-but-free sights like Air Power Park and the Cousteau Society, to family-friendly petting farms like Bluebird Gap Farm, to serious shopping meccas like the Peninsula Town Center. A kid's paradise. Buttons galore. Where else can you fly (and crash) a plane or a space shuttle over and over? Click here for details on the Virginia Air & Space Museum. Of course, the Virginia Air & Space Museum is a not particularly cheap family vacation spot, UNLESS you're a member of the ASTC program. Learn how the ASTC Program can help you get in science museums for free. For a little bit of yesteryear in the middle of the city visit Bluebird Gap Farm in Hampton. This free site boasts 60-acres of farm, antique barns, picnic areas, and nature trails, plus 250+ animals. You'[ll see the usual cows, horses, etc., plus bobcats, raccoons, deer, and peacocks. Bring quarters to feed the animals at the petting zoo. Click here for more details about Bluebird Gap Farm. If airplanes and rockets really "float your boat," it's a sunny day, and you want a free outing where the kids can let off some steam, this is a good place to go on a cheap family vacation. Click here for more details about Air Power Park. Recently rebuilt from the ground up, the former Coliseum Mall is now an quaint outdoor mecca of shops ranging from Barnes & Noble to Victoria's Secret, from Aeropostale to Macy's, from Aveda to little boutiques. Throw in restaurants like Five Guys, Chipotle, and Outback, and you have the recipe for a day of fun. And if you window shop, it's easy on your budget too! Click here to see their stores. Sometimes shopping (even without buying anything!) can be a cheap family fun experience, and one local place where that's really true is Bass Pro Shops. This huge outdoor store is fun to take the kiddies to with its immense fish tanks to look at, tents and boats to climb in, and special summer, fall, and Easter events featuring free crafts, classes and giveaways. Another great (and cheap!) local spot the whole family will enjoy is Ollie's Bargain Outlet, featuring amazing deals on close-out items. Finally, if you love thrift store bargains, Hampton's Mercury Boulevard is a thrift-store mecca, filled with a dozen or so stores that are so fun to browse through. I've found amazing bargains, like Ann Taylor, Talbots, and Lands End sweater, brand-new designer baby clothes, Coach bags, parkas, and more at ridiculously low prices. Go to my Thrift Store page to learn about my three favorite stores.